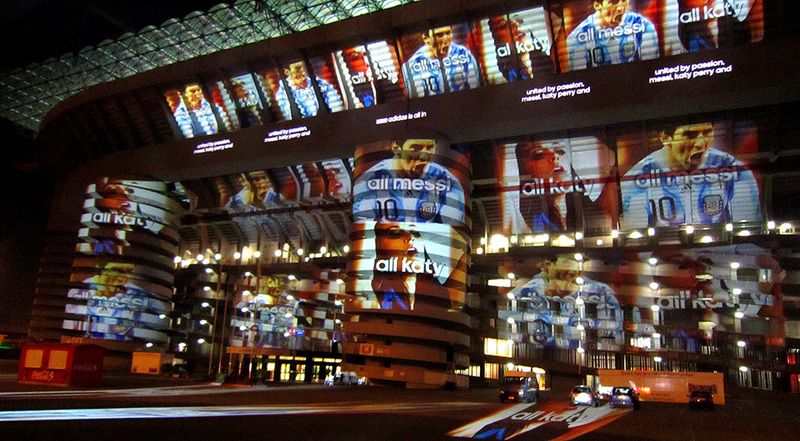 Stark projectors for the monumental projection on the San Siro stadium of the spot "adidas is all in"
A grandiose video multi-projection created for the Milan-Inter derby covered the exterior of the San Siro stadium and the interior structures as well. After the first, historic Inter-Milan Derby in 2003, the Stark philosophy of integrating video and architectural projections has once again been confirmed as the winning solution for achieving the greatest degree of spectacularity. Adidas has chosen the Milan team to promote the new 'adidas is all in' advertising campaign. With 10,000 square meters of images, this was one of the largest architectural projections ever attempted on an international level on the exterior of a stadium. Multivision designer Paolo Buroni contributed to the project with his impressive international experience in large scale events for sports.